In 1991, the United States Department of Agriculture (USDA) began a program to collect data on pesticide residues in food. In May of that same year, the USDA began operating the Pesticide Data Program (PDA). The data from the PDA is published in an annual summary. This health e-letter is going to reveal the top nine foods in that summary deemed to be highest in pesticide residues. Why worry about pesticides? They are considered hormone disrupters and, as such, can play havoc with your endocrine system. Pesticides can potentially cause cancer cells to grow and interfere with your cognitive and sexual functions. The best health advice would seem to be to avoid pesticide exposure as much as possible. On that note, here is a list of nine foods on the USDA’s black list for pesticide residues. 1. Celery clocks in at number one. 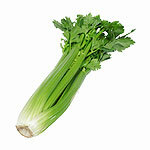 Celery has no protective skin, so pesticides settle on the vegetable and in turn are directly ingested by you. 2. Peaches have a relatively thin skin and, according to the report, are often sprayed with multiple pesticides. 3. Strawberries are only in season for a short period of time in North America. The rest of the year, they are imported from countries that are not as stringently regulated when it comes to pesticide use and, as a consequence, can be loaded with pesticide residue. 4. Apples are often heavily sprayed because there are many pests that like to burrow into the tasty fruit. Peeling does help to remove some pesticide residue, but remember that the skin holds many of the beneficial substances you need to boost your nutritional health. 5. Blueberries — normally a powerhouse on antioxidant lists — unfortunately rate high on the pesticide residue list. 6. Nectarines, like peaches, also fall prey to heavy spraying that penetrates the skin of the fruit. 7. Bell peppers have thin skins that we don’t peel before we eat them. As a result, when they are sprayed with insecticides, those chemicals end up in your digestive system, and then they can then travel throughout your body, causing damage. 8. Spinach is a healthy green, leafy vegetable, but it clocks in at number eight on the USDA list. 9. Kale is another super-healthy vegetable that unfortunately can contain high levels of pesticide residues. The best way to avoid adding toxic pesticides to your body is to buy organic– especially for these nine foods.